Drama 427/507, Intergenerational Theatre, is a combined undergraduate and graduate course. 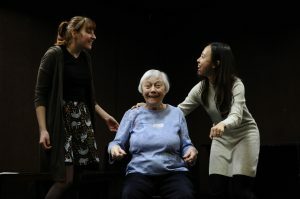 The curriculum includes research into the practice of seniors’ theatre companies, such as Age Exchange (UK), Roots and Branches (US) and StageBridge (US). 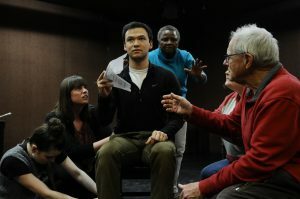 Students engage with the GeriActors & Friends in theatre workshops, devised play development, and performance. Students and seniors lead improvisations, and develop content based on stories, images and issues. At the conclusion of the course, students present either a research paper or draft of a new script. Students come from a variety of programs, including Drama, Secondary and Elementary Education, Human Ecology, Pharmacy and Public Health. Graduate Assistantships are available, and graduate students have pursued creative and research projects in Multicultural Theatre, comparative study of seniors’ theatre companies, archival analysis, dramaturgy, and program evaluation. For some students the course is included in their Certificate in Community Engagement and Service-Learning. On graduation, students follow a variety of career and academic paths, including participation in community-based theatre, teaching, overseas volunteering, and graduate programs in Drama Therapy (Concordia) and Applied Theatre (Victoria, Manchester).